(OCA) - On Great and Holy Monday—April 10, 2017—His Beatitude, Metropolitan Tikhon presided at the opening Rite of Preparation of Holy Chrism at Saint Tikhon’s Monastery. His Eminence, Archbishop Michael of New York and New Jersey, also was in attendance, as was His Beatitude, retired Metropolitan Herman. 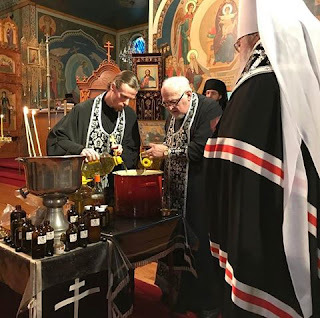 Opening prayers and the blessing of the ingredients used in confecting the Chrism took place before the celebration of the Hours and the Liturgy of the Presanctified Gifts. The Chrism will be cooked and stirred continuously through the first three days of Holy Week, during which time the Holy Gospels will be read continuously by priests, except during the celebration of the divine services. The Chrism will be consecrated in conjunction with the celebration of the Vesperal Liturgy on the morning of Great and Holy Thursday. The Consecration of Chrism is a rite reserved for the Primates of autocephalous Orthodox Churches. The last time Holy Chrism was consecrated in the Orthodox Church in America was in 2012. 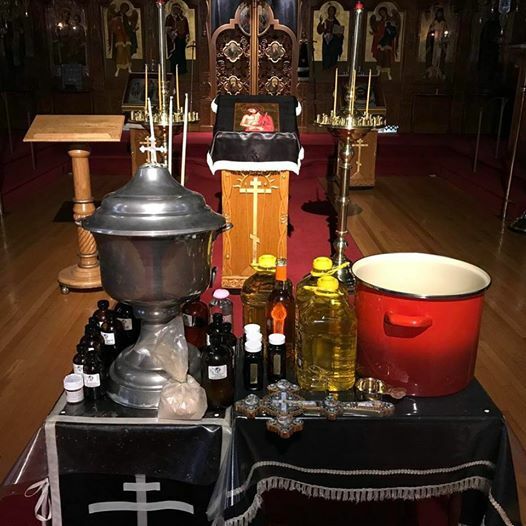 Holy Chrism—distinct from Holy Unction and other blessed oils used in Orthodox Christian rites—contains a number of ingredients, including olive oil, white table wine, benzoin, aromatic incenses extracted in oil, rose oil, basil, balsam, Venetian turpentine, galangal, oils of bergamot, clove, marjoram, thyme and sandalwood, extracts of ginger root, and nutmeg. The final selection, however, is based on the availability of fragrant oils. After the Holy Chrism is consecrated, it is then distributed to all parishes and missions for use in the celebration of the Holy Mysteries, specifically the sacrament of Chrismation. What then are we to make of the intricate ritual involved in the confection of Chrism that will take place during Holy Week at Saint Tikhon’s Monastery? The Rite of Consecration of Holy Chrism will begin on Holy Monday morning, April 10, as His Beatitude, Metropolitan Tikhon sanctifies water to bless the ingredients used in making Holy Chrism. Chrism, unlike the oil of Holy Unction and other blessed oils used in Orthodox rites, contains a number of exotic ingredients, including olive oil, white wine, styrax, benzoin, aromatic incenses extracted in oil, rose oil, basil, balsam, Venetian turpentine, galangal, oils of bergamot, clove, marjoram, thyme and sandalwood, and extracts of ginger root, calamus root, nutmeg, and orris root. (Historically there has been some variability in this mixture based on the availability of ingredients.) Bishops, priests and deacons will gather in two-hour shifts throughout the day and night from Holy Monday to Holy Thursday to mix these ingredients together in a stainless-steel pot as they are boiled and stirred continuously while the Gospels are read. This sounds like the very religion that Father Schmemann says ended with Christ. But Father Alexander also devoted much of his life to understanding the theology that emerges from the intricate liturgical rites of the Orthodox Church. It was his contention that our liturgy at its best is not religion at all, but life in Christ. And so, rather than focus on the details of confecting chrism it is essential to consider its purpose. When the new Chrism is ready, it will be poured into bottles for use throughout the 700 parishes of the Orthodox Church in America, from Canada, to the United States, to Mexico. Every time a child is baptized or a convert is chrismated, Chrism prepared in this way will be used for the anointing as the words are pronounced, “the Seal of the Gift of the Holy Spirit.” Preparing Chrism is also a unique privilege of autocephalous Churches, which connects us to the wider world and history of the Orthodox Churches. Every batch of new Chrism has drops from earlier chrism. In the Archives of the OCA we still have a lead container that held Chrism brought from Russia in 1900. The Russian Church originally received Chrism from its Mother Church, Constantinople. Thus, every anointing with Chrism is powerful testimony to unity in the Church. But it is also testimony to our conviction that the anointing with Holy Chrism is anointing with the Holy Spirit. In the early years of the Church’s existence there was no rite of Chrismation after Baptism since the Holy Spirit was conferred directly through the laying on of hands by apostles and then bishops as their successors. This is seen for example in the Acts of the Apostles: “Now when the Apostles at Jerusalem heard that Samaria had received the word of God, they sent to them Peter and John, who came down and prayed for them that they might receive the Holy Spirit, for it had not yet fallen on any of them, but they had only been baptized in the name of the Lord Jesus. Then they laid their hands upon them and they received the Holy Spirit” [Acts 8:14‑17]. Eventually Chrismation replaced the laying on of hands at Baptism as the Church turned increasingly to the Old Testament for its liturgical patterns. Bishops continued to confer the Holy Spirit, but now it was through the Holy Chrism which their hands had prepared. The origins of preparing Chrism go back to the Old Testament. Exodus 30 gives detailed instructions for the confecting of “holy anointing oil”: “Moreover, the Lord said to Moses, ‘Take the finest spices: of liquid myrrh five hundred shekels, and of sweet-smelling cinnamon half as much, that is, two hundred and fifty, and of aromatic cane two hundred and fifty, and of cassia five hundred, according to the shekel of the sanctuary, and of olive oil a hin; and you shall make of these a sacred anointing oil blended as by the perfumer; a holy anointing oil it shall be’” [Exodus 30:22-25]. This anointing oil, like Holy Chrism, was to be unlike any other oil. It was solely and specifically for anointing priests, kings, prophets and the holy vessels of the temple. Misuse of the oil for any other purpose brought a heavy penalty: “And you shall anoint Aaron and his sons, and consecrate them, that they may serve me as priests. And you shall say to the people of Israel, ‘This shall be my holy anointing oil throughout your generations. It shall not be poured upon the bodies of ordinary men, and you shall make no other like it in composition; it is holy, and it shall be holy to you. Whoever compounds any like it or whoever puts any of it on an outsider shall be cut off from his people’” [Exodus 30:30-33]. Christians re-interpret this and everything in the Old Testament through our faith in Christ, Who fulfills the ancient promises and prophecies. And so the unique anointing oil of the Old Testament is now understood in terms of God pouring out His Holy Spirit. As the Prophet Joel says—quoted by the Apostle Peter on the first day of Pentecost—“And it shall come to pass afterward, that I will pour out my spirit on all flesh; your sons and your daughters shall prophesy, your old men shall dream dreams, and your young men shall see visions. Even upon the menservants and maidservants in those days, I will pour out my spirit” [Joel 2:28-30; Acts 2: 17-18]. As you begin Holy Week, please pray for His Beatitude, Metropolitan Tikhon and all those who will be involved in the preparation of the Holy Chrism. And if you have the opportunity, go to Saint Tikhon’s Monastery to join in the prayers and listen to the Gospel readings during this special occasion. Every good and perfect gift comes from Thee, the Lord of mercy and Father of Lights. As Thou gavest to Moses Thy faithful minister, to Thy servant Samuel, and to Thy holy Apostles, so also, despite our unworthiness, give to us the grace to serve this great and life-creating Mystery. Send down Thine all-holy Spirit on this myrrh. Make it the anointment of kings, the spiritual nourishment, the preserver of life, the sanctification of souls and bodies. Make it the oil of gladness which was prefigured in the Law and shone forth in the New Testament; by which kings and high-priests, and prophets were anointed, as well as those who have been reborn in the Baptism of new life through the Apostles and Bishops and Presbyters who have succeeded them to this day. Yea, O Master, Almighty God: through the descent of Thy Holy and adored Spirit, show it to be the garment of incorruption and the seal that makes perfect. May those who receive Thy holy Baptism (which represents their naming after Thee, Thine only-begotten Son, and Thy Holy Spirit) become Thy familiars, members of Thy house, citizens and servants sanctified in soul and body, turned away from all evil and every sin, delivered by the veil of the raiment of Thy most pure glory. Through this holy sign may they be known to Thy holy angels and archangels and all the heavenly host, and may they strike fear in every evil and impure demon. May they be a chosen people, a royal priesthood, a holy nation sealed by this Thy most pure Mystery. May they bear Thy Christ in their hearts as dwelling places for Thee, the God and Father in the Holy Spirit. For holy art Thou, O our God, Who restest in the Saints, and to Thee do we send up glory to the Father, and to the Son and to the Holy Spirit, now and ever and unto ages of ages.